An update of a classic textbook covering a core subject taught on most civil engineering courses. Civil Engineering Hydraulics, 6th edition contains substantial worked example sections with an online solutions manual. 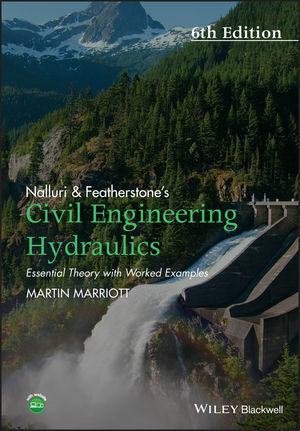 This classic text provides a succinct introduction to the theory of civil engineering hydraulics, together with a large number of worked examples and exercise problems. Each chapter contains theory sections and worked examples, followed by a list of recommended reading and references. There are further problems as a useful resource for students to tackle, and exercises to enable students to assess their understanding. The numerical answers to these are at the back of the book, and solutions are available to download from the books companion website. Martin Marriott is a chartered civil engineer with degrees from the Universities of Cambridge, London (Imperial College) and Hertfordshire. He has wide professional experience in the UK and overseas with major firms of consulting engineers, and many years of experience as a lecturer in higher education. He has an academic management role in the School of Architecture, Computing and Engineering at the University of East London.